And all of a sudden, everything was filled: at Roman Noon this Monday, in the fourth move on a US diocese within the last six days, the Pope named Bishop John Wester of Salt Lake City as the twelfth archbishop of Santa Fe, granting Archbishop Michael Sheehan's retirement after 22 years of rebuilding New Mexico's 320,000-member marquee church. Nearing the end of his three-year term as chair of USCCB Communications, the 65 year-old archbishop-elect had been the most frequently-mentioned Anglo among the potential choices for Santa Fe. A smooth, low-key conciliator in the tradition of his hometown church of San Francisco, Wester's elevation to an equal-sized, but more prestigious charge given its pallium – given the attributes of the "Land of Enchantment," quite possibly the most coveted appointment in the West – clearly bears the fingerprints of his mentor, Cardinal William Levada, as the onetime archbishop by the Bay-turned-CDF chief approaches his final year on the membership of the Congregation for Bishops before his 80th birthday in June 2016. That said, it's one thing to stanch an ecclesial mess... it's all the tougher to make something happy from it. And with a determined gentleness, the departing archbishop – who celebrates a public Noon Mass in his Chancery most days – has been able to accomplish just that. Having risen as a key lieutenant in the birth of the National Conference of Catholic Bishops (as the now-USCCB was previously known), then as rector of Dallas' ever-growing Holy Trinity Seminary, a fitting victory lap for Sheehan is already on tap: next month, the archdiocese's ordination class of seven men will be Santa Fe's largest in decades, and given the timing of the transition, the archbishop will get his wish of doing the honors himself. Back to the successor, beyond the sheer spread of Utah's 85,000 square-mile statewide church, the lead storyline of Wester's near-decade in Salt Lake has been an extraordinary level of growth that's seen the diocese's Catholic population roughly quadrupled over the last two decades, now surpassing 300,000. As the bulk of the growth has sprung from a boom in the state's Hispanic population, the succession to the new archbishop will return even more pointedly to the fault-line that marked Wester's own transfer to the heart of Mormon Country: the tension in the trenches between LDS and Catholics in ministering to the Latino influx. While the two faiths enjoy a remarkably strong relationship at the level of their respective leaderships – a trait dating to the hard-scrabble early days of Utah Catholicism – the delicacy of the situation at the grassroots was understood to have nixed any movement for the naming of a Hispanic to the post last time. Ergo, whether the preference for diplomacy can again overcome an even starker demographic reality will arguably make for the key question of the coming Salt Lake appointment. On another key front, Wester's employed the church's helm in one of the nation's most conservative states to advocate several counter-cultural positions in the local debate. Entering a charged fray at many statehouses in the post-Obamacare era, in an editorial last year, he urged the Utah legislature to support the local expansion of Medicaid, citing the church's pro-life message. Elsewhere, the diocese joined the LDS leadership in backing the recent landmark state law barring discrimination against gays and lesbians, while Wester blasted Gov. Gary Herbert in March for signing a bill allowing the continued use of firing squads in executions in lieu of lethal injection. Named an auxiliary of San Francisco in 1997 under then-Archbishop Levada, the archbishop-elect is the second protege of the "godfather" of the US church's progressive wing – the SF emeritus John Raphael Quinn – to be given a bigger berth in recent months, alongside Bishop Robert McElroy, who was installed as head of the million-member San Diego diocese earlier this month. The local presser slated for 2pm Mountain time today, Wester's installation in the "Land of Enchantment" is slated for June 4th in the Cathedral-Basilica of St Francis. At June's end, meanwhile, the incoming archbishop will join Chicago's Blase Cupich in Rome as the duo form the US contingent for the Mass at which – in a change from prior practice – the Pope will bless the year's crop of the pallium, but without placing the lambswool band on the shoulders of each new metropolitan. Intended by Francis as an act of enhanced "synodality" given the garment's role in the local church, archbishops will again receive the symbol of office in their cathedrals, returning to the ancient custom ended in 1984, when John Paul II decided instead to reserve the rite to himself on the feast of Saints Peter and Paul in the Vatican basilica. While this year's change – a "Pallium Mass" without the actual distribution of it – is a halfway measure, it is understood that a ceremony with the new archbishops is only taking place at all this year due to plans already made by several archdioceses for pilgrimages with their freshly-named heads, and the Roman event is expected to be completely discontinued after this instance. On a related note, no date has yet been set for the liturgy in Holy Name Cathedral that'll see Cupich receive his pallium as head of the province comprising Illinois. 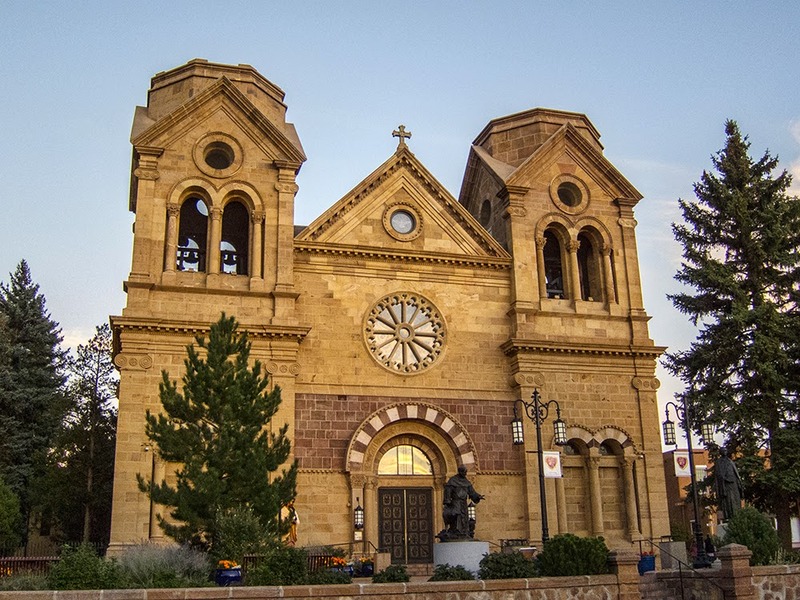 For its part, the Santa Fe province encompasses the five dioceses of New Mexico and Arizona. This morning's appointment marks the fourth US archbishop named by Francis, after Cupich, Michael Jackels of Dubuque in May 2013 and Leonard Blair of Hartford the following October. With today's move, a milestone is reached – for the first time in memory, the number of diocesan bishops on these shores serving past the retirement age of 75 is zero. 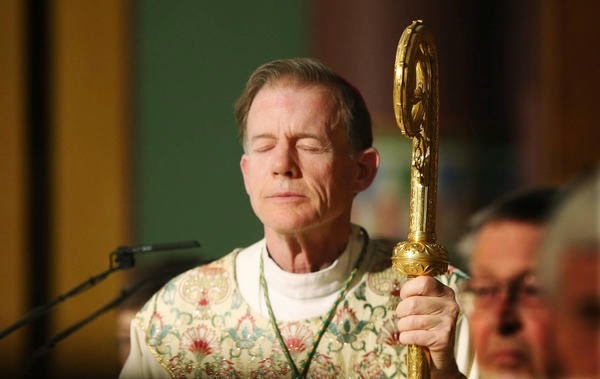 The extraordinary scenario will remain the case until Bishop William Murphy reaches the milestone atop Long Island's 1.5 million-member fold of Rockville Center on 14 May, followed later that week by Bishops Michael Jarrell of Cajun Louisiana's Lafayette church and Terry Steib SVD in the booming outpost of Memphis. After the on-deck trio, another six Stateside diocesans will age out before the end of 2015, most prominently Cardinal Donald Wuerl of Washington and Bishop Paul Loverde of Arlington come fall, setting the stage for a complete changing of the guard of the two sees covering the metro area of the nation's capital. Salt Lake now joins all of two other Stateside chairs currently vacant, Superior and Kansas City.